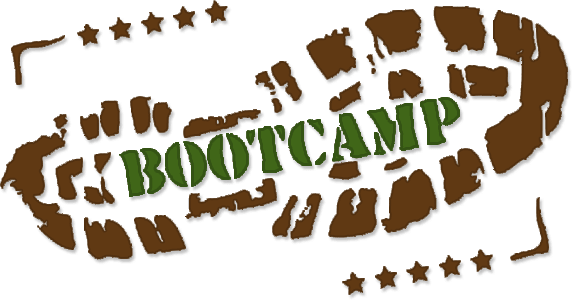 Want to Join Me For A 2-Day REI Sales BOOTCAMP And Leave With A COMPLETE, Fully Documented, Ready-To-Go, REI Sales Plan? 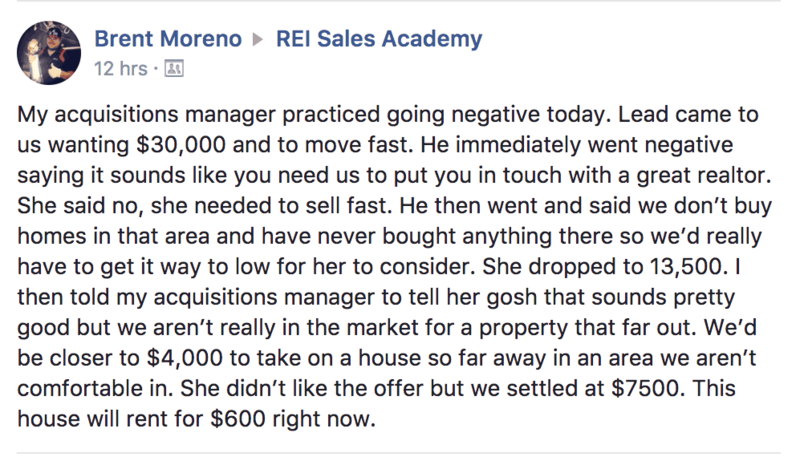 When attempting to buy homes at deep discounts, do you get stuck haggling over price, often deal with sales stalls, and struggle to sell the "value" of what you do? 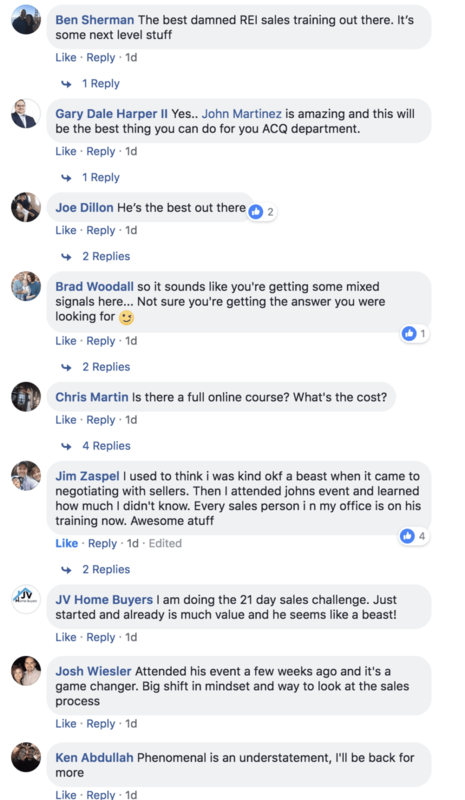 Do you want a non-manipulative way to get prospects to sell that doesn’t require sales “tricks,” groveling, discounting or other embarrassing tactics? A checklist (and examples) of what you should say to EVERY prospect BEFORE your initial sales meeting to position you as a credible, trustworthy expert. 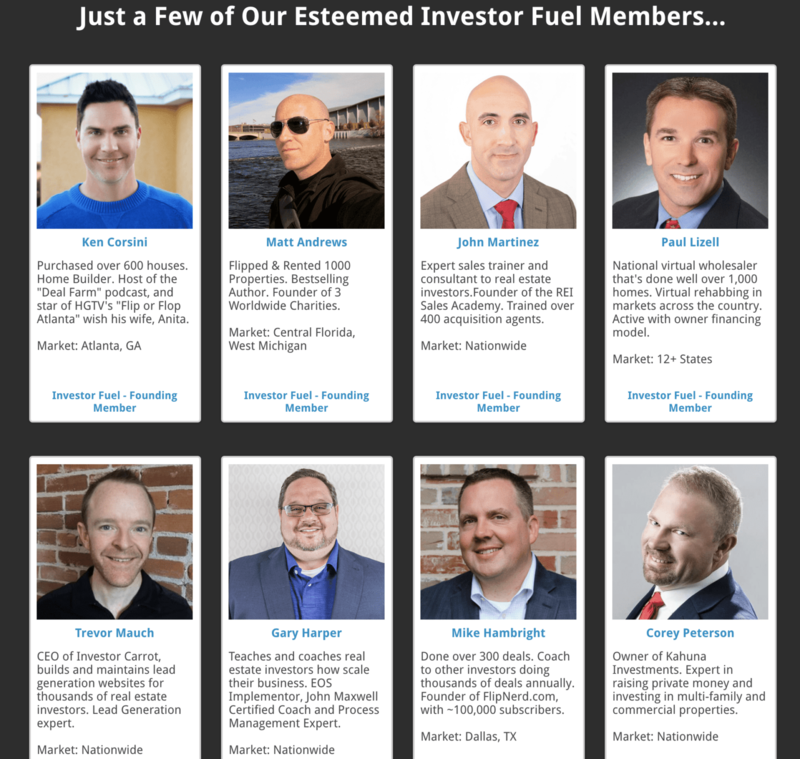 All REI Business Owners who register themselves or any team members, will be given free access to one Investor Fuel Mastermind meeting (http://investorfuel.com/home-page). 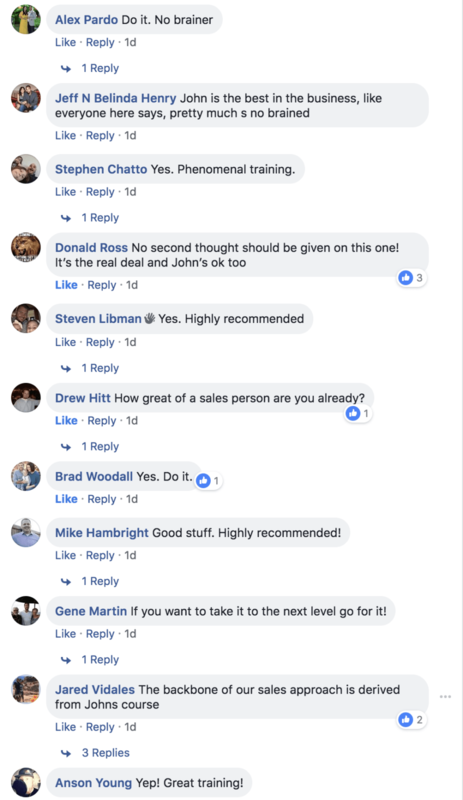 I’m a founding member along with Matt Andrews, Gary Harper, Corey “The Big Kahuna” Peterson, Trevor Mauch (CEO of Investor Carrot), Ken Corsini (star of HGTV's "Flip or Flop Atlanta”)… and many more. 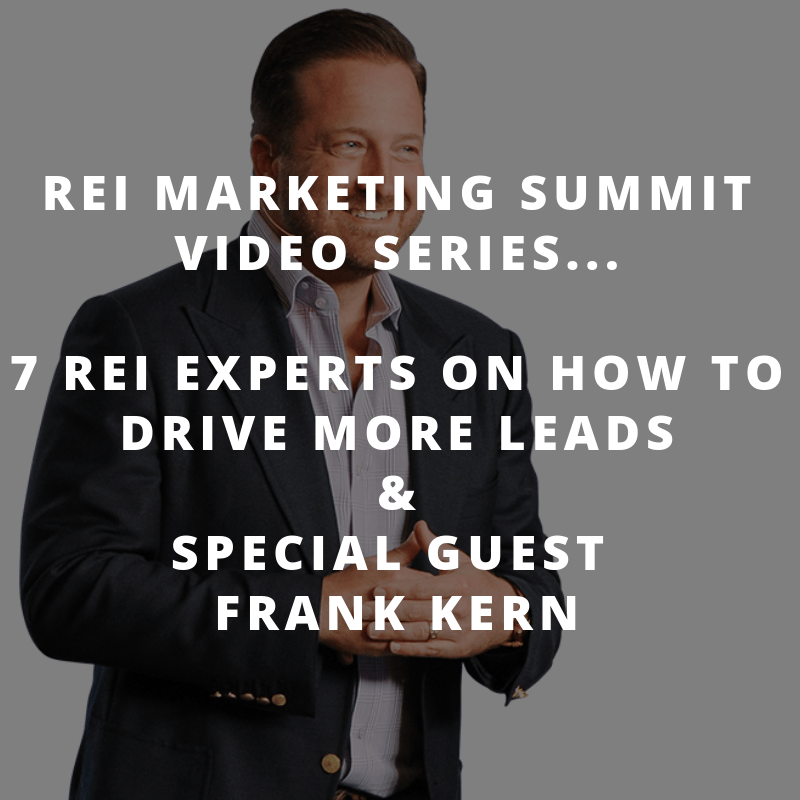 At our San Diego Bootcamp we sold tickets to a Bonus REI Marketing Summit. I had the entire thing recorded… it was like a massive best-of-the best REI Marketing Mastermind really. Wanna come hang out with me for half a day to rehab your sales systems and processes immediately following the 2-day Bootcamp? This is a legit invitation to my half-day Private Client Group. …I’m personally inviting you to my half-day Private Client Group. We’ll get down and dirty, put the pedal to the metal, and GO! The first thing we’ll do is identify the areas in your business that will have the biggest impact on sales (that need a little TLC or even a complete build out from scratch). Then, we’ll outline our plan, outline deliverables and GET TO WORK for the next 4-5 hours. All you’ll need to do is show up. This is not a Mastermind. With such a small group spending time together over a short period of time, I do imagine that lasting relationships will be formed, but if that happens, it will only be an ancillary benefit. 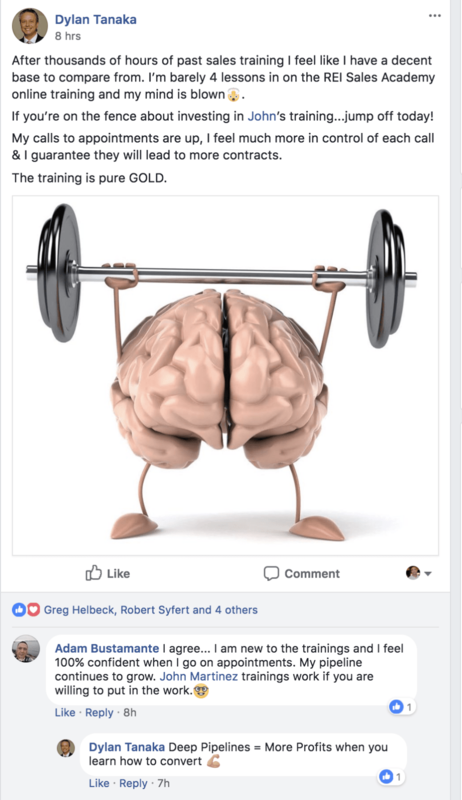 This is not Sales Training. We will focus on sales systems and processes from the leadership level. 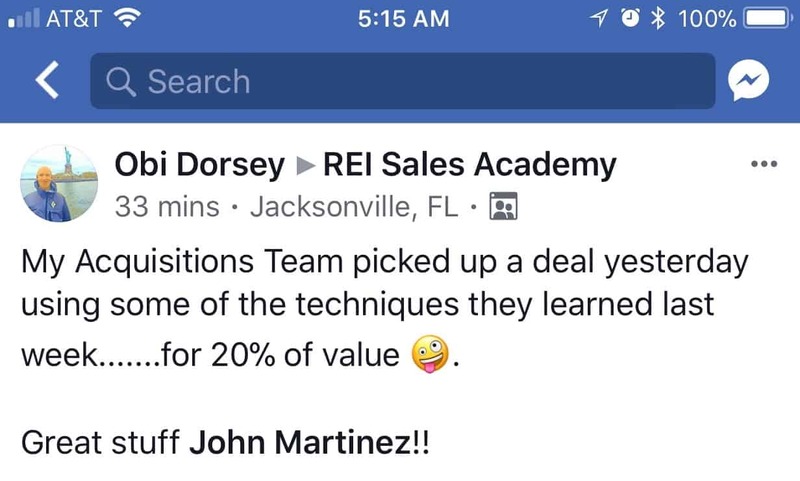 If you need sales training for acquisition agents, it is a different service. You'll learn how to close every closable deal. You'll learn how to shorten your sales cycle, often closing on your first call. You'll learn how to buy at the deepest discounts possible. You'll learn how to beat out your competition (even when they offer more money). Your sales calls will become relaxed and pressure-free for both you and your prospects. We'll spend two days together in a workshop environment... this isn't a seminar... we'll get down and dirty together. I'll teach, then we'll all practice. I'll grease the wheels by giving out cash to everyone who participates (this makes it a ton of fun by the way). Within 48 hours, you'll receive a welcome/informational email from the REI Sales Academy. Then you'll want to book your accommodations (a discounted room reservation link will be emailed out to you). Participate and play full out... role play with us, practice with us, laugh with us, and have FUN! Gravitate toward your next great adventure at Gaylord Opryland Resort & Convention Center. Situated in the heart of Nashville, our luxury hotel allows you to hit all the high notes of Music City both in the area and under our roof. Looking to make a splash? SoundWaves, an upscale water experience featuring 4 acres of combined indoor and outdoor water attractions, is now open right on site. Catch a show at Grand Ole Opry and Ryman Auditorium, then return to our 9 acres of lush indoor gardens and cascading waterfalls. We also offer a full-service spa for a more relaxing way to unwind. When it's time to refuel, sip and savor in our stylish steak, Mexican, Italian and Japanese restaurants followed by a frozen yogurt or gelato dessert. 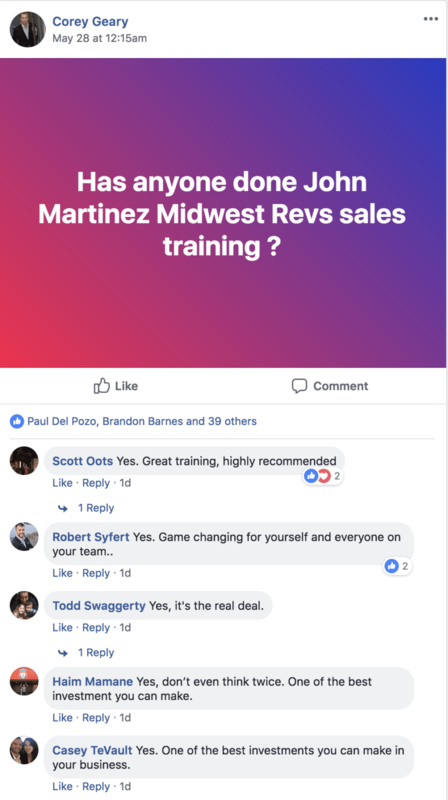 Too Many "Maybes" & "Think-It-Overs"
Chasing Prospects Who Have "Gone Dark"
This is the part where I'm supposed to get you to act now... because if you don't you'll miss out on something. We do sell out every single Bootcamp. This one will also sell out... guaranteed. I'm not here to "convince" you of anything. Truth be told... I don't need to. 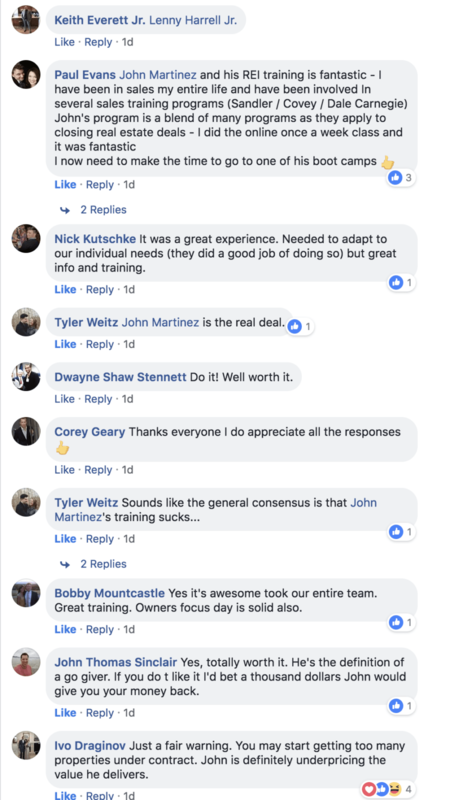 Our results over the last 5 years, while working with hundreds of the top investors in the country, speak for themselves. This is really a question of "do I need to buy more houses at even deeper discounts"? 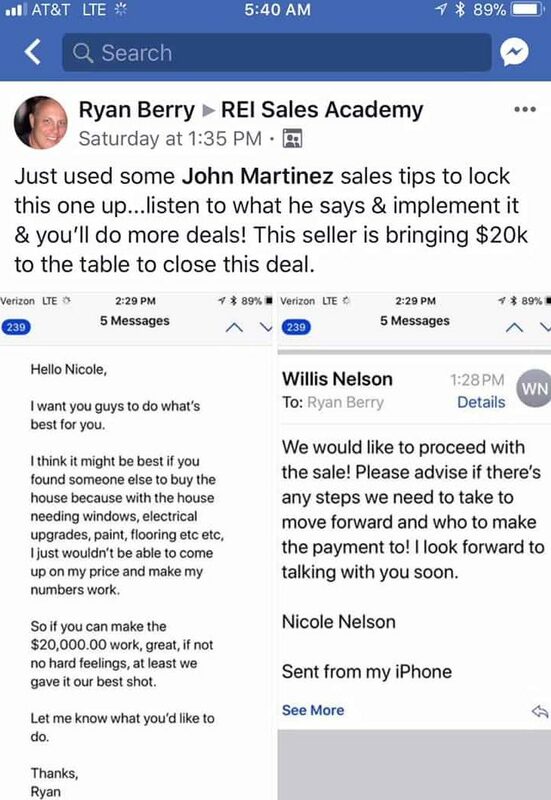 If you are already closing every closable deal at the deepest discounts possible... you don't need this. If you're not, and would like to, is it worth the ticket price to do so? If you answer that question... you'll know whether it makes sense for you or not.